Every third Thursday of the month, Professional Dimensions members gather at an informal and social networking event. It’s an opportunity to get together with members outside of meetings, get to know each other better, and explore a local venue. January brought us to the Sherman Phoenix, an interesting collection of businesses that brought out the curious, consumers and champions within our membership. In that same spirit, the February 3rd Thursday is also an unusual venue that should bring out the cocktail, curious, creative, and consumer crowd. GreyHouse is a woman-owned boutique, craft workshop, bar and café. 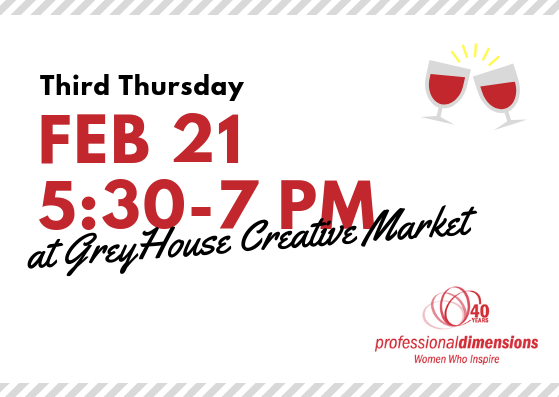 Come socialize and network on Feb. 21st in this very centrally located spot.